The way GM handled a fatal flaw provides grist for instructors in engineering ethics. 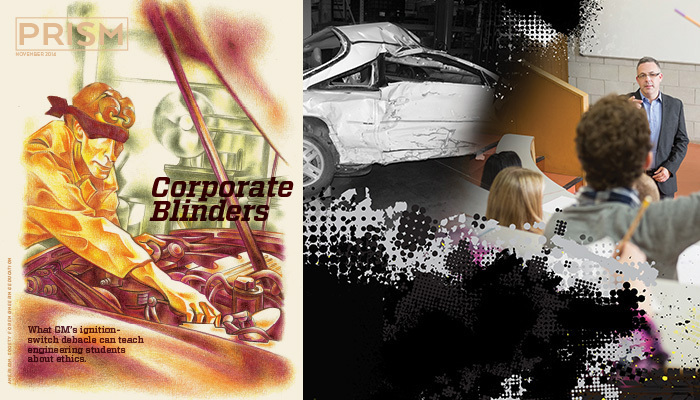 Indeed, the litany of documented lapses at GM has all the makings of a classic contemporary lesson in ethical frailty, according to several engineering ethics instructors — on a par with such frequently taught examples as the Challenger space shuttle disaster, the Ford Pinto’s explosion-prone fuel system, and the Chevrolet Corvair, the main subject of the 1965 Ralph Nader book, Unsafe at Any Speed. Moreover, compared with these earlier cases, the ignition switch episode appears to have involved more ethics failures by engineers as opposed to marketing gurus, bean counters, executives, or lawyers. “It’s overwhelming how much there is to it,” says Henry Petroski, who holds dual professorships in civil engineering and history at Duke University and is a widely cited authority on the causes of engineering failures. (He has a regular column in Prism.) “There’s a younger generation of engineers coming in” who can relate to the GM case, he says. A trove of material about the GM debacle already exists, from newspaper articles and technical papers to a painstakingly detailed — and stunningly blunt — 315-page report by Anton R. Valukas, a former U.S. attorney whom GM’s new chief executive officer, Mary Barra, hired to investigate the firm’s history with the ignition switch. The probe, completed last May 29, involved some 350 interviews with 230 persons and covered more than 41 million documents, providing a rich vein for instructors and students to mine. The flawed part made headlines starting last February, when GM recalled some 1.6 million vehicles containing the switch that had been sold worldwide during the mid- and late-2000s. The list included models of the Chevrolet Cobalt and HHR station wagon, the Saturn Ion, the Pontiac G5, the Saturn Sky, and the Pontiac Solstice. But the story began with a decision made by one man more than a decade earlier that would prove momentous. In 2002, Valukas reported, a GM engineer, Ray DeGiorgio, approved the use of a newly designed ignition switch for the Saturn Ion even though the device fell below the auto company’s minimum specifications. Too little force – “torque” – was required to turn the key. This meant that the key could easily revert from the “run” to the “off” position, causing the car to stall – even on highways. Other problems at the prototype stage had already forced a redesign of the switch’s whole electrical concept. DeGiorgio, who called it “the switch from hell,” didn’t want any change that might compromise the electrical system. He thought incorrectly that the low torque would not affect the vehicle’s performance. At the time of the Chevrolet Cobalt launch in 2004, a journalist informed Doug Parks, the Cobalt chief engineer, that while adjusting his seat in a test vehicle he had “turned off the car by hitting his knee against the key fob or chain,” according to the report. Gary Altman, the program engineering manager, tested a Cobalt and replicated the incident, but “he and Parks regarded the incident as an isolated event with no safety implications – the prevailing view within GM.” The carmaker also brushed aside warnings from its suppliers. Siemens VTO Automotive cautioned the company about the switch even before General Motors decided to use it. Valukas report suggests should have been apparent to anyone familiar with air bag design and operation. That left drivers whose cars crashed as a result of a stall especially at risk. GM engineers briefly considered changing the ignition key design, but didn’t follow through formally. Then, DeGiorgio himself quietly authorized use of a new design in 2006. Switches on later models required more torque, or force, to turn the ignition on or off, addressing the defect. However, he “deliberately” omitted changing the part number — a step that would have served notice that the switches in earlier versions of the cars had been seriously flawed, the report said. And he never told other GM engineers about it. No recall notice was issued for vehicles containing the flawed part until years later. Instead, the company issued a technical service bulletin (TSB) advising its dealers to counsel customers who complained about the stall-out problem to remove heavy items from their key rings and to offer them a key insert that would reduce the likelihood that the switch would rotate accidentally and cut off the ignition. It was a 2005 Cobalt, built the year before DeGiorgio authorized the switch change, that sent Natasha Weigel, 18, and Amy Rademaker, 15, to their deaths on a two-lane road in Wisconsin in October 2007, prompting a state trooper’s investigation of why the vehicle’s air bags had not deployed. The trooper’s finding was “discounted” by GM investigator Brian Stouffer, along with warnings from the Indiana University Transportation Research Center, and a plaintiff’s expert. Each had examined the cars and reviewed GM’s TSB and found that the stalling caused by the faulty ignition switches disabled the air bags and made them useless. The Valukas report says Stouffer was “misled by DeGiorgio’s statement that the same ignition switch was in early and later model year vehicles.” The investigation languished. It was only after outside engineer Erin Shipp, a plaintiff’s expert in a product liability case, X-rayed the original and replacement switches that the facts came to light. Even then, months would pass before a recall was ordered to fix the switch. As late as December 2013, chief engineer John Calabrese “questioned the data demonstrating the problem,” Valukas reports. While GM’s top executives didn’t know about the Cobalt ignition switch problem until late 2013, the report says, the company maintained a corporate culture that emphasized cost-cutting and discouraged lower- and middle-level managers from raising problems or concerns that they thought might get them into trouble and spark retaliation by higher-ups. Even before the report’s release, GM established a new global product integrity unit under a vice president, Ken Morris, an engineer, whose job is to look into problems involving safety and quality performance and make sure they are dealt with. Barra put in place a vice president for safety, Jeff Boyer, raising safety decision-making “to the highest levels;” added 35 safety investigators; and launched a Speak Up for Safety program that encourages employees to report potential problems. Meanwhile, the death toll attributed to the defective switch is rising. Last March, the Valukas report estimated that the faulty ignition switch had been blamed for 54 crashes and 13 deaths. By mid-October, GM’s website reported that 1,371 claims had been filed—178 of them for alleged wrongful deaths. It said the company had designated 52 claims as eligible for payment from its compensation fund, including 27 for wrongful deaths. Other claims were still being reviewed. Why did it take 12 years? Engineering ethics instructors say their primary goal is not to shape students into puritanical fussbudgets, but rather to give them a moral framework to use in thinking through workplace situations that appear to pose ethical problems. Students learn what the ethics codes of their respective disciplines demand and how they apply to situations they are likely to encounter on the job. For instance, engineers are obliged to report designs and practices that they believe will injure or kill people; to follow accepted practices on documenting changes they propose to help prevent such outcomes; and to follow up on cases in which a corporate culture fails or refuses to deal with these problems. In working the GM case into her courses, Grossenbacher plans to focus on questions such as: How did this debacle happen? Why was DeGiorgio able to approve the design of the flawed ignition switch on his own — and later replace the part without properly documenting it? Why did GM’s engineering review panel decline to reclassify the ignition switch malfunction as a full-fledged safety issue rather than a “customer convenience” concern? How did GM’s corporate culture contribute to what looked like an internal communication problem? And why did it take 12 years before GM did anything about the flawed part? Among those who have already used the GM case in class is Brian Patrick Green, assistant director of the Markkula Center for Applied Ethics at Santa Clara University, who teaches ethics at its School of Engineering. He started by distributing the introduction and summary of the Valukas report to his students and asking them to write a review about what they read. Michael Gorman, a professor of engineering and society at the University of Virginia School of Engineering and Applied Science, plans to use the GM story in an engineering ethics course for seniors in January, although not in the full-fledged case-study format he adopts for the Challenger incident. To Gorman, the GM affair exemplifies two kinds of organizational dysfunction: first, a dangerously diluted chain of responsibility within the company, and, second, “the lack of a clear decision-maker” who might have focused early on finding the problems that the flawed ignition switch posed and then quickly taken steps to resolve them. “I’d like to have students discuss whether this represents an ethical decision or an engineering decision,” Gorman says. Later, he’ll build a more traditional academic case study, which crafts a similar set of facts and data without disclosing they derive from the GM experience—and have students put themselves in the places of the key participants. “It’s an exercise in applied ethical reasoning,” he says. To Patricia Werhane, a professor of business ethics at DePaul University, the GM debacle is “a great case of how people develop blind spots”—and an interesting twist on the different mind-sets that engineers and managers traditionally use in handling the kinds of problems that GM encountered in the ignition switch affair. Despite the wealth of detail now available, there are concerns about moving too quickly to build a case-study out of an engineering controversy that’s still evolving —especially one such as the GM debacle, which has been more than a dozen years in the making and still is running through the court system. Although the drama of the case may pique students’ interest at the moment, instructors risk the possibility that further investigations may prove some of the currently accepted accounts of what happened to be wrong. Participants may still be reluctant to discuss the imbroglio. Academics could face criticism for sloppiness, or even libel. “There are going to be lawsuits over this, so it’s not inconceivable that GM is going to be holding back information or asking that the records be sealed,” Duke’s Petroski says. “If so, then all those potentially valuable ‘lessons learned’ haven’t been revealed.” Ronald Arkin, a professor at Georgia Tech’s College of Computing, agrees. “This is a case in progress,” says Arkin, who teaches ethics to engineering students as part of a course on Robots and Society. Michael Davis, who teaches engineering ethics at the Illinois Institute of Technology, insists the GM case is ripe enough for picking. Davis, who warned in an ASEE paper in 2006 that it was too soon to turn the Hurricane Katrina flooding of the previous year into a case study on engineering ethics, doesn’t share the hesitancy about the GM affair. Art Pine is a former Washington correspondent for the Los Angeles Times, The Wall Street Journal, and The Baltimore Sun. Print cover illustration by Francis Igot.